Long before we had books, we had stories. Tales of how we came here, who came before us, our grandparents and our ancestors, have always been passed on. Woven in those tales were all the lessons and warnings we needed to survive. In the legends of the Native Americans animals were often messengers from Great Spirit and the bearer of many painful and amusing life lessons. The elder grandmothers and grandfathers would gather the village children while their parents hunted and farmed. They were the schoolteachers of their day, and they taught through stories. Today the Pueblo Indians of New Mexico express this tradition through a resurgence of pottery art. The artist will gather the clay from sacred mountain-sites, harvest local herbs and vegetables to create authentic colors, and, keeping the ancient ways, fire the clay on an open pit. 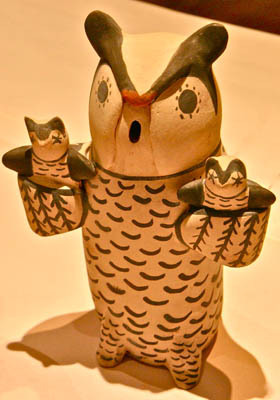 The storyteller is depicted in native dress, often with the head tilted back, the eyes closed, and the mouth open in song. The babies cry or laugh, play or appear distracted, but as the truth unfolds through mythical tales, all are touched by the rhythm of the storyteller. 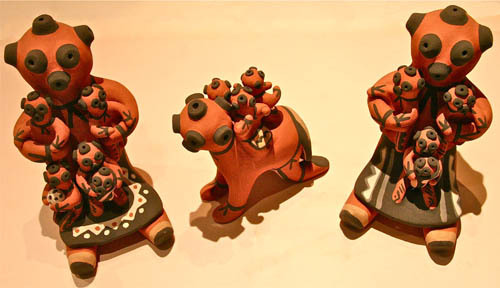 "Storyteller Dolls and Their Little Listeners"
The Pueblo Storyteller: Development of a Figurative Ceramic Tradition , by Barbara A. Babcock, Guy Monthan, and Doris Monthan. Pueblo Storyteller , by Diane Hoyt-Goldsmith. Told from 10-year-old April's point of view who lives with her grandparents in the Chochiti Pueblo, this is the story of generations of storyteller makers who continue the tradition. Signed copies may be available through our gallery.